A couple of months ago, I guest blogged at Outblush.com (see link here), and I was given the opportunity to muse on whatever I liked, as long as it was about women’s fashion. I blogged about authentic women’s riding boots, because I have always loved the amazing construction and patina that comes from clothing as “tools,” taking on a used beauty that only comes from being depended on, loved and worn. But to own and wear a pair of these beauties is: 1. difficult for a man who isn’t an Argentine polo player and 2. an affectation at best and 3. uncomfortable at worst around town. Three rainy days in NYC last week got me thinking about real-deal Wellingtons. Based on a cavalry boot designed by the Duke of Wellington in the early 1800s, wellies weren’t rubber-made until mid-century. From downtown hipster dudes to impeccably groomed Eastside men and women, the best were shod in khaki green wellies, some guys with pants tucked in, tough to pull off in anything other than denim, and with leggings on the fairer of the species. I’m not talking about the Burberry-printed rubber rain boots favored by the Robertson crowd, or Marc Jacobs $20 throw-aways, I’m talking about English hiking and hunting boots that are rubber because that’s the only way to ensure that your feet are dry. A little research, impromptu polling and Google made it pretty easy to track down the brands of choice. The top of the line, Le Chameau, aren’t from England but are French made. The story is pretty amazing. 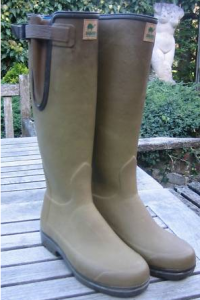 It takes nine months of training before a Le Chameau boot maker actually gets his hands on the natural rubber used to make these boots from start to finish, here’s a link to a video on the production process. Natural rubber is the best material as it isn’t prone to cuts or cracking like synthetics. The best part of the top of the line Le Chameau boots is that they are lined with top of the line calf leather to ensure a great fit, and to avoid the clammy feel and heat buildup that is sure to come from a day of pheasant hunting, bog trekking, or Soho shopping. This kind of luxury doesn’t come cheap, but Le Chameau claims that these boots can last for decades. They’re available in the U.S. at Orvis. There are very few buddies that that appreciate my eccentricities in total. From cars to bikes to ukes, and also wellies, only Puma’s Chief Marketing Officer and 15-year friend, Antonio Bertone, really gets why I dig the stuff I dig. I tracked Tony down—the weird mobile ring gave away his globe-trotting—to tell him about the Le Chameau boots. He listened thoughtfully, and then I quickly realized that he was way ahead of me on this. Puma’s incubated baby brand Tretorn has been not only a leader in ‘70s tennis gear, but also the wellies of choice for mud hungry Swedes who are much more likely to hike than hunt. Although not available for men in the U.S., the Tretorn Sarek Milleniums are top flight and top choice for Swedes. Although I had trouble translating the page and doing the currency conversion, they look to be about a quarter of the price of Le Chameaus. As I write this, today would qualify as a summer day in most of the Northern Hemisphere. It’s 72 degrees Fahrenheit at 8 am, not a cloud in the sky, and I’m contemplating a surf, sans wetsuit. While the whole Wellington thing seems a bit extreme, for me, it really is about things that feature substance over mere form. The low-tech and anachronistic Land Rover Defender 90, shell cordovan, Filson bags and Jade yoga mats. Focus on the Donut has become a meditation for me on a theme. Thanks for indulging me, it’s much appreciated. Thanks for this post. 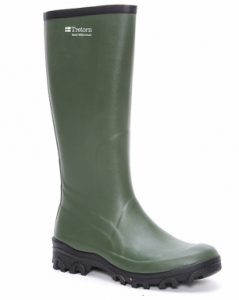 I have worn Hunter Wellies all my life, the English variety, in traditional hunter green. They are indeed a bot clammy and offer no protection from the cold, although when relatively new, are truly waterproof and light on the foot, important factors when one is moving around the stable and farm all day.